Follow the shore road around Rosehearty and head towards the building that looks like a control tower. Take the path that lies in front of this over the moor next to a dry stane dyke. When you reach the farm house track at either Egyypt or quarryhead, follow it till it reaches the minor road and head west along this road until you reach Mill Farm. At this point the road becomes a track which heads up the hill. Follow this track until it ends where you will be able to see the road leading down to Pennan in the distance. Turn right at this point and follow the track on to Pennan farm. There is track down to the harbour from the farm, it runs downthe side of the gorge but it is difficult to find. Don’t be tempted to find an alternative route as the cliffs are sheer. This was a lovely walk, I started off early and the sun was shining after a heavy night of rain last night. The walk around Rosehearty and along the minor road leading Pennan was pleasant enough, but the highlight of the walk was definitely Pennan itself. 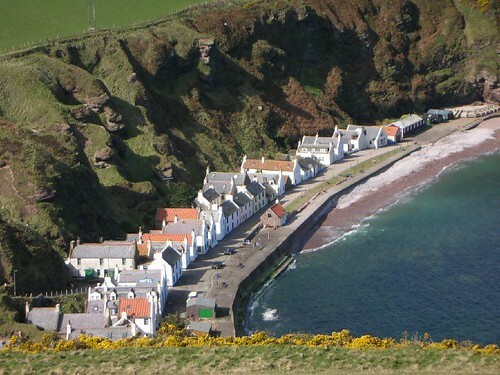 Pennan was the setting for one of my favourite films; “Local Hero” which was made in 1983. There is famous scene featuring a telephone box and I was pleased to see that the phone box was still there. The hotel had been taken over quite recently and I had a delicious haddock and chips there. Pennan itself nestles at the foot of a deep gorge and is protected by cliffs, but I was sorry to hear that there was only permanent resident living in the village, and that all the other houses where second or holiday cottages. I suppose there is no work around to support people from the area, but it was sad to see such a deserted village. Nonetheless, Pennan is still one of the highlights of my walk so far and I’m looking forward to starting the walk from there next time. You are currently browsing the Scottish Coastal Walk blog archives for the day Wednesday, April 26th, 2006.